Architectural Digest has revamped itself (thank god) and whilst having a little peak on line I was rather delighted to come across this space by designer Todd Alexander. Its bijou, its in the heart of Manhattan and its rather fabulous. Apparently Billy Baldwin was the inspiration and the thing that grabs me more than anything else is the moody midnight blue. 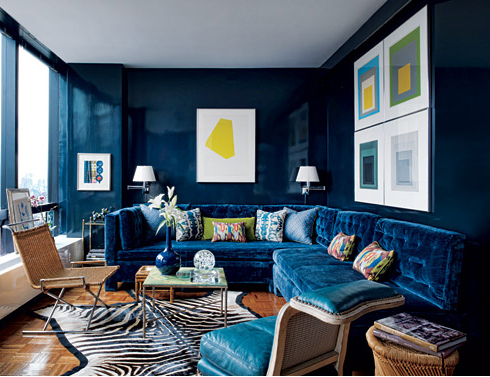 He lacquered all the walls (super glam) upholstered a sofa in a similar hue and coupled classic furnishings with daring splashes of colour. 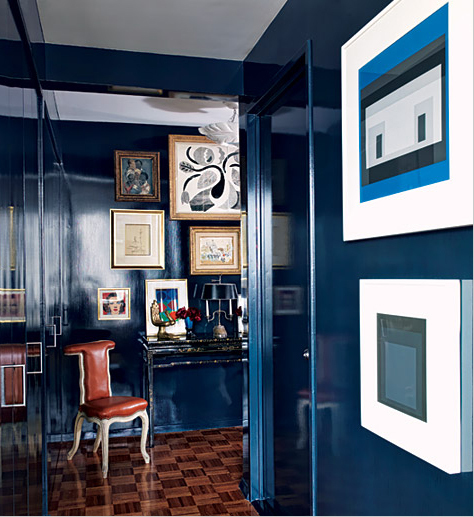 Just goes to show that in a very small space painting walls dark won’t repeat won’t make rooms appear smaller – instead walls almost recede.I adore the lacquered walls the play of light upon them is mesmerising. The entrance way – da ta if this wouldn’t lift your spirits walking through the door each day then I don’t know what would! These are lovely images – thankyou – they have brightened up an otherwise cold and grey day! That was one of my fav articles in the newly relaunched AD mag. A few months ago I was thinking of doing this for a client but the prep time is insane and we didn’t have enough time. I will be at tonight’s Ralph Lauren launch for the new AD mag featuring Margaret Russell. Will let you know how it was. Laquered walls? Beautiful but how would you even start doing that?